Red-tailed black sharks or Epalzeorhynchus bicolor belong to the family Cyprinidae. This family of fish is also known as Cyprinids. In layman's term, the red-tail is a member of the carp family. The red-tailed black shark was native to Thailand. But sadly, they are now extinct in the wild. All the red-tails available in fish stores today are commercially raised products of the aquarium trade industry. Red-tails black sharks, of course, bear no relation to sharks. Their name is purely descriptive. They have a black, torpedo-shaped body with a profile reminiscent of that of sharks. This includes a sharp triangular shaped dorsal fin. Their bright red caudal fin (tail) completes their visual appearance and name. As with any member of the carp family they are primarily bottom dwelling scavenger fish. Scavenger fish can be identified by their downward pointed mouths with varying sets of barbels on either side. Barbels are whisker-like sensory organs that contain taste buds much like your tongue. Their primary function is for locating food. 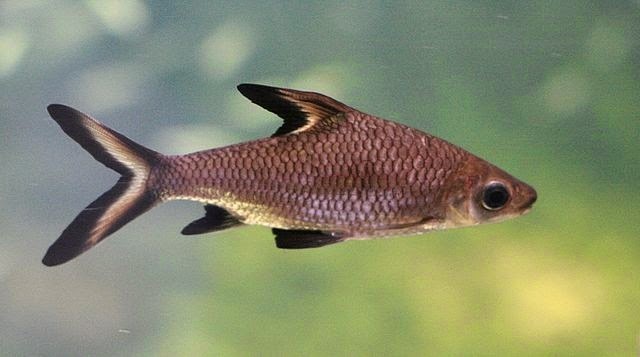 They serve a secondary function of enabling the fish to find its way along riverbed basins at night or in murky water. Red-tails are generally considered compatible in community tanks. Interspecies conflicts are rare. But a more robust fish such as barbs, larger tetras, and the less timid cichlids, are a good choice as tank-mates. As with most bottom dwellers, it is a good idea to provide rock work or hollow aquarium décor for resting and hiding. When it comes to cohabitation with members of their own species they tend to become extremely territorial; especially the males. The dominant male will often chase the submissive male around. They have been known to harass their less dominant counterpart depriving them of any chance to rest or eat. This often results in the death of the submissive red-tail. Fellow bottom dwellers have also been known to bring out the red-tails territorial instincts. They may become combative with red-finned sharks and Siamese algae eaters. So if a red-tail is your scavenger of choice it is a good idea to allow him to be the king of his substrate domain. Red-tails have a much wider tolerance range to pH levels than most other fish. Anywhere from 6.5-7.5 will suffice. Acceptable water temperatures are 72-79 °F. They can reach 5 inches. They don't tend to grow as long in smaller aquariums. Females are typically a little smaller than males. Their life expectancy is up to six years. Red-tailed are omnivores. They can usually fend for themselves just fine with food scraps on the aquarium substrate. However, food such as sinking wafers will ensure their nutritional needs are meant. The spacious environment of fish farms produces enough of these fish to keep their prices very reasonable at your local retailer or online fish-mart. This is a good thing since they are extinct in their natural habitats and rarely breed in aquariums. Their innate aggressive behavior and the aquarium owners' tendency to purchase a single scavenger fish undoubtedly contributes to this rarity. The latest trend among Saltwater Tank enthusiasts is raising pet jellyfish. Jellyfish need specially designed Jellyfish Fish Tank Aquariums. Jellyfish tanks are easier to maintain than traditional saltwater setups. Moon Jellies are the most popular jellyfish among home aquarists both for their exotic beauty and their ease of care. They have become so popular that two US-based websites are now tank raising them to meet the growing demand. Pet Moon Jellyfish look absolutely incredible under a fading LED lighting system. Although the name suggests otherwise, the Silver Shark is actually a minnow. This fish has many monikers including, Bala shark, tricolor shark, tri-color shark minnow, hangus, Malaysian shark, and silver Bala. Last, but certainly not least there is also the scientific binomial name, Balantiocheilus melanopterus. Silver sharks are found in the fresh waters of South East Asia. Although they are bred in captivity by professional breeders, the vast majority of them are still caught in the wild. In fact, so many are caught that silver sharks are making their way onto the endangered species list. They are very easy to identify in an aquarium. When they are healthy, they have a shiny silver body and jet black bands on the back edge of their fins. Their dorsal and tail fins are reminiscent of a shark; that is why they are called silver "sharks". When fed certain foods they may have an additional yellowish color between the silver body and black fin bands. Hence the name tri color shark. When bought in the store they are usually between 1 and 2 inches long. With proper nutrition and comfortable surrounds, they should be nearly 10 inches long after a few years. If yours are not that long, don't forget that all fish are individuals and their genetics have a large part in determining how large they will grow. After all, not all humans are 6 feet tall. The silver shark's maximum length is said to be 14 inches. A fish that big will require quite a large aquarium. Silver sharks do best when kept in a shoal of 5 or more silver sharks. If you keep them in smaller numbers they may be aggressive towards other members of the aquarium community. If you are lucky enough to have 5 or more silvers and they all grow to be 12 inches or more long your tank will have to be at least 125 gallons. And make sure that you have a lid securely fastened over the tank because they are jumpers. Silver Sharks are relatively weak when it comes to disease resistance. They will become sick before most other members of the aquarium. So if your silver sharks are coming down with something make sure you pay a little more attention to the health of your fishes. Can You Have SHARKS in a Freshwater Aquarium? Sharks are certainly one of the most captivating creatures in the water. They excite, frighten, and intrigue us like no other sea creature. Everybody knows that sharks are from the ocean, but are there such things as freshwater sharks? Is it possible for the adventurous aquarist to keep sharks in a freshwater aquarium? There are a couple of shark species that venture into the fresh water, such as river sharks and occasionally bull sharks, but they generally need at least brackish (somewhat salty) water to survive. So since there are no true sharks that live in freshwater it is impossible to keep them in a home freshwater aquarium. If you have done any browsing in a fish or pet store it is possible that you came across some fish that were labeled "sharks". If they were not in a saltwater tank, then they weren't sharks. There are a few tropical fish that, due to their appearance, have been given a common name containing "shark", but they are not true sharks. A few of these so-called sharks are very popular in freshwater fish tanks, though, and are worth a look if you are stocking a tank. The most common of these is the red-tailed shark, scientific name Labeo Bicolor, which earned its name of "shark" because of its dorsal fin, but that is a stretch. Regardless, the red-tailed shark and the rainbow (or red-finned) shark are great additions to almost any community tank. They have distinct coloration and get to be decent size without growing too big. They are generally shy but they do get a bit territorial, although they rarely inflict any damage to other fish in the tank. The Bala shark is another falsely named but very popular freshwater aquarium fish. The Bala shark is very peaceful and makes a good addition to a larger community aquarium. They definitely prefer a bigger tank because they are very active swimmers and by home aquarium standards, get fairly large (5" or so). They are excellent jumpers so a covered tank is a must. One other common "shark" is the black fin shark catfish, sometimes called a black tipped shark. Of all of the freshwater fish mistakenly called sharks, this one has the closest actual resemblance. It has a gray, streamlined body with a dorsal fin very similar in shape to a shark, but alas, it is simply a catfish. This fish is not the best choice for general community tanks; it will grow fairly large, chase other fish, and eat small fish if they will fit in his mouth. It is best kept with other larger fish. For those looking to stock "real" sharks in a freshwater aquarium, you are out of luck. On the plus side, some of the commonly available "sharks" at the fish store are wonderful fish to add to a community aquarium and are well worth considering. Drew Bartlett has over 30 years experience with setting up and maintaining freshwater aquariums. He is the author of The Essential Beginners Guide to Freshwater Aquariums. Put a Shark in your Aquarium! Bala’s are in the tropical semi-aggressive community and grow from 4″ to 17″ or more. Bala Shark is versatile in the fish tank, they don’t hesitate to explore all levels in the water. You can find the Bala’s shooting from top to bottom. Bala’s are great for a community aquarium as they are non-aggressive. The funny thing about Bala’s as they belong to the minnow family! Their dorsal is what gives them the shark identity. Bala sharks like to hop out of the water so if you don’t have the hood closed on your fish tank your Bala Shark may jump out and flop around on the floor. A secure tight cover is number 1 with Bala’s. Bala Sharks are omnivores so they can chow down on some meat or plants. Prepared foods such as vegetables and live foods like worms suit the fish well for its diet. You can feed Bala Sharks fish flakes, frozen foods, live foods from tubifex worms to daphnia. They even gorge down mosquito larvae, worms, and brine shrimp. Remember to balance your Bala’s diet by tossing in some veggies. For some reason fish like zucchini. It’s the universal veggie, but peas and romaine lettuce will work too. Feed what the shark will eat up to 3 minutes and alternate between meat and vegetation to keep your Bala’s diet in sync. Tip Place your fish tank in a low traffic area away from exposing sunlight and AC/Heat vents to keep your tanks water temperature controlled. Other Bala Sharks include the Red-Tailed Bala (Aggressive fish), Red Spotted, Roselin, Silver-tip, Rainbow, and Variegated. Sand sharks are viewed as the most timid and least aggressive of the shark species. Sand sharks are usually smaller in size than other sharks and move fairly slowly. These sharks are found all over the Atlantic Ocean, and are the most common type of shark. Although these sharks would seem to be the perfect aquarium kept fish, because of their smaller size, they are not. They still grow to reach an average length of about five feet, and can weigh as much as three hundred pounds. This is really too large to keep in a home aquarium. The population of these sharks has dwindled in recent years, due to fishing activities. Therefore they are being considered for the endangered species list. It would be irresponsible to attempt to house one of these creatures, unless fully educated on their care needs. Sand sharks adapt the best of all sharks to a captive environment. The types of aquariums that house these very large fish are usually public state supported aquariums. These facilities have the resources to build large enough tanks to house the sharks. Sand sharks can be kept in a tank with other large fish. The sharks are usually fed three to four times a week to discourage them from eating tank mates. For the most part this works well, although, every so often some of the fish seem to disappear. When housing sharks, care should be taken to ensure there is adequate space for swimming. Sharks by nature cruise the open waters. When visiting a public aquarium, notice sand sharks tend to be constantly moving, while some of the other fish just hang out in the tank. A good alternative for a sand shark in a home aquarium is the catfish shark. Although labeled as a shark because of their dorsal fins, these creatures are much smaller. They usually grow to be about a foot long. They will still need a larger tank with plenty of space, because they too will have a cruising nature. These fish, like true sharks will eat just about anything that will fit in their mouths. Therefore be careful not to house it with smaller fish. The catfish shark should be kept in a tank with brackish water. Brackish water is more difficult to maintain because it is a mixture of both salt and freshwater. In the wild these fish live in areas where ocean waters meet streams or rivers. The Albemarle Sound is an example of brackish water. The same general type of equipment is required for brackish water and saltwater aquariums as fresh water. It is a good idea to upgrade filters and heaters, however, because saltwater and brackish water fish are more sensitive to water irregularities. Sharks are accustomed to a darker environment, so it is not necessary to have a lot of lighting. Sand sharks have the same basic care requirements as most other fish. They need, and adequate food source, regulated water and an environment that would be similar to their natural habitat.